However on the afternoon of Saturday August 4 2012 during the actual celebrations, organised by Helensburgh Heritage Trust, the sun shone all the time. Then, at 5.30pm, once the celebrations were over, a torrential thunderstorm took place, which unfortunately meant that the barbecue at the Royal Northern and Clyde Yacht Club at Rhu had to be moved indoors. But first things first. The weekend started off on the evening of Friday August 3 when an exhibition on Henry Bell and the Comet was officially opened in Helensburgh Library in West King Street. It will remain open until October 31. Doris Gentles was the person behind this and she had a lot of help from Eleanor Mackay of Argyll and Bute Council in putting it together. Some 40 people attended the opening ceremony, and these included two descendants of Henry Bell's brother, Thomas. A surprise guest of honour was in attendance the following day — Henry Bell himself! 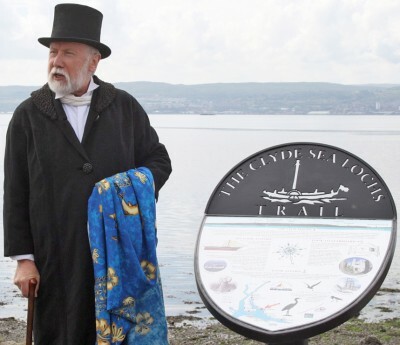 In the morning he performed the unveiling of an explanatory Sea Lochs Trail board on Helensburgh's West Esplanade at the foot of John Street. This had initially been put up some 10 years ago, but the writing and pictures on it had weathered so badly that it was no longer legible. He then went on to greet passengers arriving off the paddle steamer Waverley. The Henry Bell obelisk at the foot of James Street had been decorated with signal flags, and an attractive display of flower tubs had been set up along West Clyde Street. At almost the same time a trailer arrived at the east end of the Esplanade bearing the painted plywood replica of the Comet Archway — minus its posts — which would have been erected at the foot of Sinclair Street, had Argyll and Bute councillors not rejected it. It looked most colourful and attracted a lot of favourable comments from the public — all we need to do now is find a new home for it! From 2pm onwards things really started to happen. Helensburgh Modellers Club launched their excellent radio-controlled model of the Comet into the waters behind the pier, and in the course of the afternoon other models also took to the water, including the Maid of the Loch and the Royal Yacht Britannia. 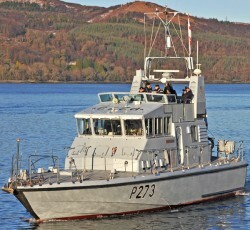 At the same time a procession of assorted craft which had set off from Rhu Marina began to come into view, led by HMS Pursuer, a Royal Navy patrol boat based at the HM Naval Base Clyde at Faslane. Closely following were two very attractive Victorian-style steamboats, Silkie and Talisker, and the sound of their steam whistles attracted further crowds. There had not been a breath of wind in the morning, but in the afternoon a gentle breeze picked up. This was just enough to enable some of the yachts which had come from the Marina and all of the dinghies to put up their sails, and to give a colourful display very close in to Helensburgh Pier. The Rhu RNLI lifeboat carried out a mock rescue of a canoeist who had fallen out of his boat and had set off flares in the water. Meanwhile Henry Bell himself had been mingling with the crowds, who also purchased Comet souvenirs from a stall on the pier. The rescue by the lifeboat brought proceedings largely to a close, and the procession of assorted vessels then made their way back to Rhu Marina. It is very difficult to know just how many people saw all or part of the celebrations, particularly as visitors came and went down the pier. However there were quite possibly at least 500 people there at one point, and so the total numbers could very easily have been in excess of 1000. None of this would have been possible without the financial assistance which we received from various sources, and in particular from Argyll and Bute Council and the Heritage Lottery Fund. The photograph of HMS Pursuer is Crown Copyright.